Gayatri Chakravorty Spivak, director of the CSSD Rural-Urban Interface project, was interviewed about the Rohingya refugee disaster for TBS eFM's "This Morning" English radio program in Seoul, Korea. 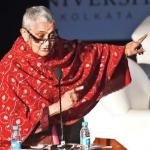 Spivak's interview is available for online listening here. Newer PostLila Abu-Lughod joins amicus brief against the Executive Order on the "Muslim Ban"